All of ChiaoGoo TWIST sets include 5″ (13 cm), surgical stainless steel, lace tips and three cable lengths to make 24″ (60 cm), 32″ (80 cm) and 40″ (100 cm) circulars. TWIST red cables are memory free! They consist of a multi-strand, steel cable coated with red nylon. 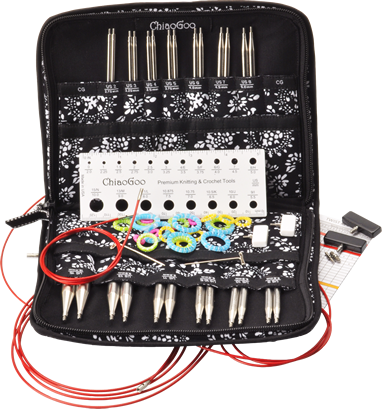 Also included with each set are easy-to-read, coded cable connectors, end stoppers, T-shaped tightening keys, stitch markers, a needle gauge and compact, zipper-enclosed, fabric case. TWIST & SPIN tips, cables and accessories are all switchable!